April 9, 2016, 2:30 p.m.
Join me for a talk about comparative oncology and all the ways dogs are helping in the war on cancer. Location: 50 Main St., Westford, MA 01886. April 11, 2016, 6 p.m.: Join me as I review some of the most controversial practices in the anti-aging industry, including the promotion of human growth hormone and bio-identical estrogen and progesterone to aging people–practices that are backed up by unproven scientific claims. Location: Hunneman Hall, Brookline Public Library, 361 Washington Street, Brookline, MA 02445. Free of charge, but registration is required at 617-730-2770. 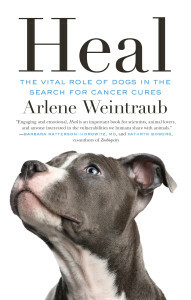 April 12, 2016, 7 p.m.
As part of the “100 Author Visits in 1 Year” series, I’ll be presenting a multimedia talk and Q&A about how dogs are helping in the war on cancer. Come to one of the schools featured in Heal to learn more about comparative oncology and the process of making the book come to life. March 7, 6 p.m.: Join me for a talk and multimedia presentation about Heal. March 10, 2016, 9:30 a.m.: Join me and three other authors for a luncheon and book talk. Location: Skyline Country Club, 5200 East St. Andrews Drive, Tucson, AZ 85718. Join me and authors Alison Deming and Sy Montgomery for a discussion about how animals inspired our latest literary works. Location: University of Arizona, Koffler Room 204, Tucson, AZ 85721. Get more information about the festival here. March 22, 2016, 6 p.m.
Join me for a talk about Penn veterinary school’s role in comparative oncology, as featured in Heal. Location: 3601 Walnut St., Philadelphia, PA 19104. November 1-15, 2015: Join me and more than 6,000 dog-loving readers for an online Q&A about Heal. Join at no charge here and get a 10% discount on the book if you order from DogWise. November 1-30, 2015: Sign up for the Goodreads group All About Animals and participate in a Q&A about the book here. Come to Clever Canines of Calgary for a discussion and live demonstration of how dogs are using their amazing sense of smell to detect cancer. Well-trained dogs are welcome to join their owners at this event. Location: Clever Canines, 320 – 5539 2nd St. SW, Calgary. Imagine what would happen if dogs thought, felt and talked like humans. Or imagine a character drama, set in an apartment building, told from the perspective of a goldfish. Or imagine how you’d choose your own adventure as the feline protagonist in a pick-a-plot book. Or just imagine if canines could cure cancer. A must-see for animal lovers. Location: Arts Commons — Big Secret Theatre 205 8th Ave. SE, Calgary. Friday, September 11, 2015, 8:15 a.m.: Panel moderator, “Exploring Legal, Regulatory and Economic Concerns Associated With the Development of Advanced Biological Drugs for Use in Animals” with David A. Brake of BioQuest Associates and Natasha Leskovsek of Cooley LLP. Location: The Carlton Hotel, 88 Madison Ave, New York, NY 10016. Saturday, March 14, 11:30 a.m.-12:30 p.m.: Panel moderator, “30 Days to a Better Brain” with former surgeon general Dr. Richard Carmona, University of Arizona, Chemistry Room 111. Dr. Carmona will be signing books afterwards. Saturday, March 14, 2:30-3:30 p.m.: Panel moderator, “Healthy Bodies/Healthy Minds: Preventive and Responsive Medicine for Our Times,” with former surgeon general Dr. Richard Carmona (author of 30 Days to a Better Brain) and Dr. Peter Rhee, Chief of Trauma, Critical Care, Burns and Emergency Surgery and Professor of Surgery at the University of Arizona (author of Trauma Red). Science City – Main Stage. The authors will be signing books afterwards. Sunday, March 15, 10:15 a.m.-12:30 p.m.: Book sale and signing at Author Pavilion – Central. Come hear more about Heal!